The Baker Hughes U.S. rig count was down seven this week to 1,764. 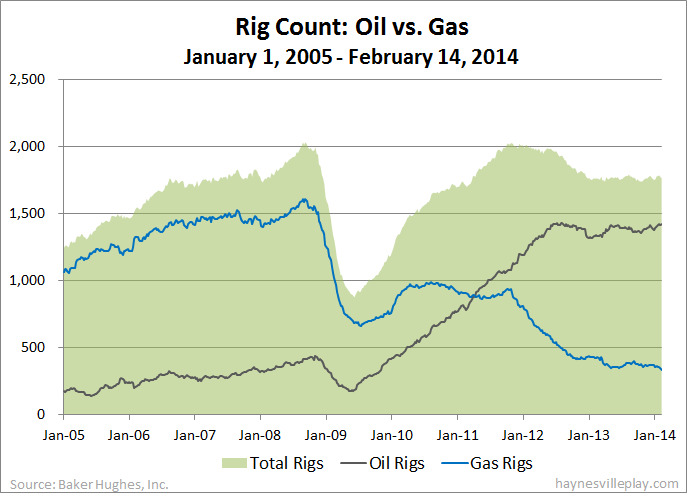 Oil rigs were up seven to 1,423, gas rigs were down 14 to 337 and miscellaneous rigs held at four. The current level of gas rigs is the lowest since May 19, 1995 (as measured by BHI from July 1987). By contrast, the gas rig count peaked at 1,606 on September 12, 2008. By type, horizontal rigs were up seven to 1,183, vertical rigs were down nine to 380 and directional rigs were down five to 201. Among gas rigs, horizontal rigs were down five to 251, directional rigs were down eight to 56 and vertical rigs were down one to 30.